It’s January 1943. Australia is at war and Perth is buzzing. US troops have permanently docked in the city in what local men refer to bitterly as the American occupation, and Perth women are having the time of their lives. The Americans have money, accents like movie stars, smart tailored uniforms and good manners. What’s more, they love to dance and show a girl a good time, and young women are throwing caution to the wind and pushing social boundaries with their behaviour. Not Meg Eaton, however. The war has brought her nothing but heartbreak, stealing her young love eighteen months ago. Until, in the middle of a Perth heat-wave, she meets her lost lover’s brother, Tom – standing over a dead body in her neighbour’s backyard. “It was in the middle of a Perth heatwave, in the middle of a world war. It was the day I met my dead lover’s brother and discovered a body in my neighbour’s backyard. The day my life changed forever….” Burrows’ first novel has a lyrical start. She weaves an interesting story of a young girl who lost her love to the war and has stumbled on his brother in her street and they together find a dead body in the neighbour’s yard. The war years in Perth are depicted with detail. As a Yank, I finally understand the old saying about the US soldiers stationed in Australia—‘over-paid, over-sexed, and over here’. 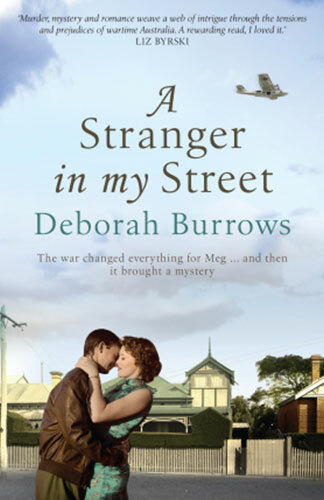 The realistic setting and character development catch your imagination about the war years in Australia. As an historian, Burrows shines in this part of her narrative. However, one gets the feeling that this book is based on a template of the mystery/romance novel. The romance takes up a good two thirds of the book, and given the age of the heroine (20), I suppose that would fit. The romance itself fits the era—nothing too graphic, but there none the less. But could it not be just as effective to have fewer goings on about the romance side of things and do more with the murder? Finally we get to the murder, and the twists and turns that Burrows weaves demonstrate her extensive knowledge of medicine and legal processes–her other interests–and these interests are the ones that perhaps need more development. I didn’t think I would enjoy a novel about the war years, but I was pleasantly surprised. I look forward to another offering from Deborah Burrows.